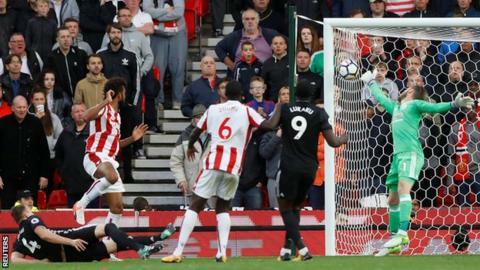 Eric Maxim Choupo-Moting scored twice as Stoke ended Manchester United's 100% start to the new Premier League season. Summer signing Choupo-Moting put Stoke ahead in the 43rd minute, powerfully finishing a fine team move for his first goal for the club. That was the first goal United had conceded in 535 minutes of league football, a run stretching back to last season, but Jose Mourinho's side equalised less than three minutes later. Paul Pogba headed towards goal from a corner and the ball was inadvertently directed into the net off the back of Marcus Rashford's head. Romelu Lukaku put the Red Devils in front shortly after the break but Choupo-Moting levelled in the 63rd minute, heading in Xherdan Shaqiri's corner at the back post. As both sides pushed for a winner, Lukaku wasted an excellent chance in the 81st minute when he fired over from Antonio Valencia's cross after losing his marker eight yards out. Stoke goalkeeper Jack Butland then produced a brilliant reaction save to prevent an own goal in stoppage time. The draw ends a run of three consecutive victories for United although they do return to the top of the table on goal difference from Manchester City. United have been free-flowing in their three victories so far this season, but on a ground where they have not won since the retirement of Sir Alex Ferguson they were again left frustrated. As well as scoring 10 goals in their opening three games they had also also kept three clean sheets, and Mourinho may point to defensive errors as the reason for dropping their first points. For the first goal, Mame Biram Diouf was given too much space to cross and Eric Bailly lost Choupo-Moting in the penalty area. For the hosts' second, Phil Jones stumbled to allow the Cameroon winger to head home unmarked. But United had chances to win the game, with Lukaku's miss late in the second half a poor effort. Rashford had two efforts saved in the first half by Butland and it would have been harsh on Stoke had the England goalkeeper been beaten in stoppage time through a deflection off Kurt Zouma. Instead Butland dropped low to his right to palm away the ball and secure a second successive draw that takes Mark Hughes' side up to 10th. Hughes has signed a number of flair players in recent years with varying degrees of success, but Choupo-Moting showed he could well be the clinical player Stoke have been searching for. The 28-year-old, who joined on a free transfer following the end of his contract at Bundesliga club Schalke, was effective playing in a fluid forward line alongside Shaqiri and Jese Rodriguez. Shaqiri had two strikes from distance smartly saved by David de Gea in the first half and Jese forced the Spaniard into a sensational save in the second period from point-blank range. Former United pair Darren Fletcher and Diouf also impressed and each played a key role in the Potters' well-worked opener. Fletcher found Diouf with an accurate cross-field before the wing-back's excellent early centre was swept home by Choupo-Moting. Mourinho and Hughes did not shake hands at full-time after the pair exchanged words earlier in the match. Former United striker Hughes said: "I'm not sure why he didn't want to shake my hand. I didn't think there were any issues. "There was a time he came into my technical box and I told him to get out but that was it. Maybe that was what upset him." Mourinho swiftly ended his post-match interview with the BBC after being asked about the incident. "I prefer not to answer the question. Your question is a bad question," he said. "It makes it look like it's my fault, my problem, and your question is not correct. I'm sorry." It is understood Mourinho felt he had been insulted by Hughes after stepping into the Welshman's technical area. Stoke manager Mark Hughes: "He [Choupo-Moting] will get the headlines and rightly so because he was a big part of the performance and the result overall. "He should be pleased and I was delighted when I got him here. It was a decent bit of business. "We were up against the best side in the Premier League judging by what they have shown so far. We didn't allow them as much space and everything I asked the guys to do, they fulfilled." Manchester United Jose Mourinho: "I'm not satisfied with a point because we were the team closer to winning. It is a result I accept, though. "One team tried to win, one team tried to get the point but they fought hard to get that point - they defended well, they counter-attacked and in set-pieces they are powerful. Manchester United haven't won any of their five Premier League away games at Stoke since Sir Alex Ferguson retired in 2013 (D3 L2) - only at Chelsea, Tottenham (4 each) and Cardiff (once) have they failed to win in the league since the Scotsman left. Choupo-Moting's opener was the first goal Manchester United had conceded in 535 minutes of Premier League football, since Harry Kane's strike at White Hart Lane in May. Only Wayne Rooney (15) scored more Premier League goals as a teenager for Man Utd than Rashford has (currently 12, same as Ryan Giggs). Lukaku's strike was his 150th in club football (47 Anderlecht, 17 West Brom, 87 Everton and 5 for Manchester United). No player has scored more goals in their first four Premier League games for Man Utd than Lukaku (4, same as Louis Saha, Robin van Persie and Zlatan Ibrahimovic). Choupo-Moting became the first player to open his Premier League goal account with a brace against Manchester United since Afonso Alves in April 2008. Mark Hughes has become only the second manager to go unbeaten in four consecutive Premier League managerial clashes with Jose Mourinho, after Ronald Koeman (5 games). 60% of Stoke's shots were taken by Chopou-Moting (6/10), who scored with both of his shots on target. Manchester United host FC Basel in their Champions League opener on Tuesday (19:45 BST) before facing Everton at Old Trafford in the Premier League on Sunday (16:00). Stoke meanwhile travel to St James' Park to face Newcastle in the league on Saturday (15:00). Match ends, Stoke City 2, Manchester United 2. Second Half ends, Stoke City 2, Manchester United 2. Attempt missed. Paul Pogba (Manchester United) left footed shot from the centre of the box is high and wide to the left. Assisted by Anthony Martial. Corner, Manchester United. Conceded by Erik Pieters. Attempt blocked. Romelu Lukaku (Manchester United) left footed shot from outside the box is blocked. Darren Fletcher (Stoke City) wins a free kick in the defensive half. Kurt Zouma (Stoke City) wins a free kick on the right wing. Attempt missed. Matteo Darmian (Manchester United) right footed shot from outside the box is too high following a corner. Substitution, Manchester United. Jesse Lingard replaces Henrikh Mkhitaryan. Attempt missed. Romelu Lukaku (Manchester United) left footed shot from the centre of the box is too high. Assisted by Anthony Martial with a cross. Corner, Stoke City. Conceded by Eric Bailly. Attempt saved. Paul Pogba (Manchester United) left footed shot from outside the box is saved in the centre of the goal. Assisted by Henrikh Mkhitaryan. Substitution, Manchester United. Juan Mata replaces Marcus Rashford. Attempt missed. Eric Maxim Choupo-Moting (Stoke City) right footed shot from outside the box misses to the left. Assisted by Erik Pieters. Attempt missed. Antonio Valencia (Manchester United) right footed shot from outside the box is close, but misses to the left following a corner. Corner, Manchester United. Conceded by Kevin Wimmer. Goal! Stoke City 2, Manchester United 2. Eric Maxim Choupo-Moting (Stoke City) header from very close range to the top left corner. Assisted by Xherdan Shaqiri with a cross following a corner. Corner, Stoke City. Conceded by David de Gea. Attempt saved. Jesé (Stoke City) right footed shot from the centre of the box is saved in the top centre of the goal. Assisted by Erik Pieters with a cross.